There’s no right or wrong way for how to decorate your planner. I don’t know about you, but I have a tendency to be a bit of a perfectionist. However, I prefer my planner decorating to be a stress-relieving (not stress-inducing) activity. So, I like to focus on having fun. After all, if you mess up a spread, you only have to look at it for another week (or month) or less. Play, make mistakes, and remember to enjoy the process. Here are my tips and ideas on How to Decorate Your Planner. Want to see how I decorate my planner? When you’re trying to figure out How to Decorate Your Planner, it can be difficult to know where to start. So, I made a video to help you! This is a chatty Plan-with-Me style of video where I show you how to decorate your first planner spread with just washi tape. It’s a really easy and affordable way to get started! 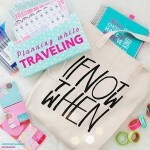 Plan with Me is a style of video where you follow along as someone decorates their planner. Some planners film their Plan with Me as is and some speed up their video. There are many styles of Plan with Me videos, and it’s fun to watch a variety of them. You can search for “Plan with Me” on YouTube, and I also suggest adding the name of the planner you have to your search if you want videos tailored to your exact planner. Personally, I think most planner tips can be transferred from one type of planner to the other, watching any is helpful. Especially when you’re just getting started! Check out my latest planner videos on my YouTube channel for other types of planner and lifestyle videos. Click here to subscribe to The Chic Life on YouTube to get notified of my latest videos! And you can click here to see my blog posts and tons of photos of my planner layouts. How do you make your planner chic? Did you use any of my tips? I’d love to see them. Share a photo on Instagram, twitter, etc. and tag it with #mychicplanner so I can check it out. 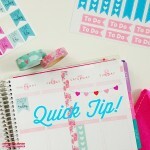 Want to Learn How to Use and Decorate Your Planner? 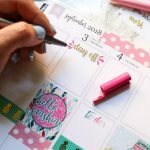 Join the Best Year Yet Planner Challenge! Thanks for stopping by! Hope you found this How to Decorate Your Planner page and/or my videos helpful!